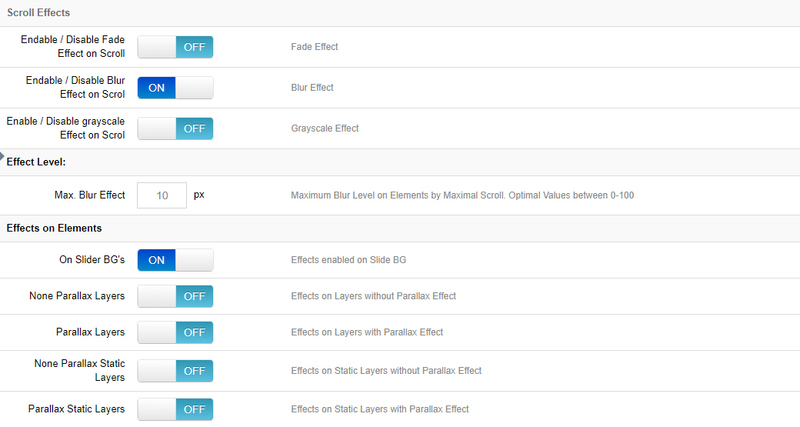 Choose which effects to apply to the content as the slider is scrolled into and out of view. The blur effect’s strength will never become higher than this amount. Apply scroll effect(s) to the slider’s main background. Apply scroll effect(s) to all Layers that don’t have Parallax enabled. Apply scroll effect(s) to all Layers that have Parallax enabled. Apply scroll effect(s) to all Static Layers that don’t have Parallax enabled. Apply scroll effect(s) to all Static Layers that have Parallax enabled. Bottom Direction = Apply the effect(s) when the page is scrolled down. Top Direction = Only apply the effect(s) when the page is scrolled back up. Both Direction = Apply the effect(s) for both “Top” and “Bottom” scrolling. The effect will be applied until this percentage of the slider is outside the page’s viewport. Choose to disable Scroll Effects for mobile devices.